Angling for a new Android 3.1 tablet, are ya? If so, Archos has a new pair emerging from Paris today, the 80 G9 and 101 G9. Predictably, the biggest differentiator between the two is the screen size, with the former offering an 8-inch panel with a 1024 x 768 screen resolution and the latter stepping up to a 10.1-incher (1280 x 800). Both of ’em are proudly using Seagate’s 7mm Momentus Thin in order to scale to 250GB, but of course, only time will tell how a power-hungry HDD will do in tablet form factor. Under the hood, you’ll find a dual-core OMAP 4 processor (1.5GHz ARM Cortex A9), support for Flash, access to the Android Market and a full-size USB port — one that’s good for accepting the outfit’s new G9 3G WWAN stick ($49). You’ll also get an HDMI output, support for 1080p playback and a pay-as-you-go option with the aforesaid 3G dongle. The duo is scheduled to go on sale at the end of September (you know, just a month or two before Ice Cream Sandwich makes Honeycomb look like old hat), with the 80 G9 going for $279 and the 101 G9 for $349. Don’t ever say Archos’ accountants didn’t look out for you. Update: We snagged a gallery’s worth of hands-on shots from Archos’ reveal today in Paris. We’re running back for more as we type, so hang tight! Update 2: A reader over at Engadget Spanish noticed that the ES specifications link for the new G9 tablets mentions a 16GB + microSD arrangement for those who aren’t feeling a 250GB HDD. Interesting! Gallery: Archos G9 series tablet hands-on gallery! 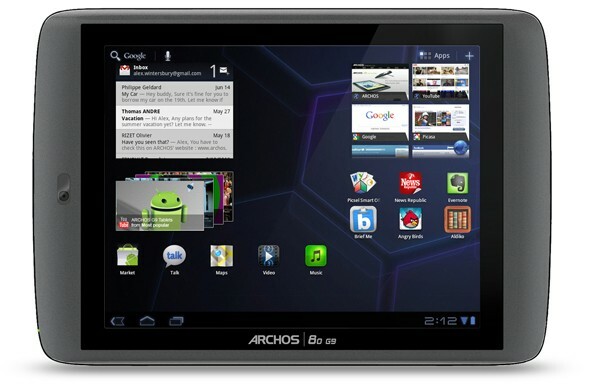 Archos intros 80 G9 and 101 G9 Android 3.1 tablets: 1.5GHz CPU, 250GB HDD, 3G-ready (hands-on) originally appeared on Engadget on Thu, 23 Jun 2011 12:46:00 EST.